In this hilarious story, an arrogant aristocrat mistakes Lady Carlotta for her new governess. Playing the part, Lady Carlotta professes to expertise as a tutor using "the Schartz-Metterklume method." A rich come-uppance is served. "You must be Miss Hope, the governess I've come to meet," said the apparition, in a tone that admitted of very little argument. "It's gone astray," said the alleged governess, falling in with the excellent rule of life that the absent are always to blame; the luggage had, in point of fact, behaved with perfect correctitude. "I've just telegraphed about it," she added, with a nearer approach to truth. "One must in justice admit that there is some provocation," continued the romancer. "Mrs. Teep is quite the most irritating bridge-player that I have ever sat down with; her leads and declarations would condone a certain amount of brutality in her partner, but to souse her with the contents of the only soda-water syphon in the house on a Sunday afternoon, when one couldn't get another, argues an indifference to the comfort of others which I cannot altogether overlook. You may think me hasty in my judgments, but it was practically on account of the syphon incident that I left." "Ah, history," he observed sagely; "now in teaching them history you must take care to interest them in what they learn. You must make them feel that they are being introduced to the life-stories of men and women who really lived - "
"I've told her all that," interposed Mrs. Quabarl. "We are having a history lesson," came the unexpected reply. "I am supposed to be Rome, and Viola up there is the she-wolf; not a real wolf, but the figure of one that the Romans used to set store by - I forget why. Claude and Wilfrid have gone to fetch the shabby women." "Yes, they've got to carry them off. They didn't want to, but Miss Hope got one of father's fives-bats and said she'd give them a number nine spanking if they didn't, so they've gone to do it." A loud, angry screaming from the direction of the lawn drew Mrs. Quabarl thither in hot haste, fearful lest the threatened castigation might even now be in process of infliction. 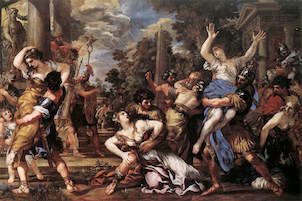 The outcry, however, came principally from the two small daughters of the lodge-keeper, who were being hauled and pushed towards the house by the panting and dishevelled Claude and Wilfrid, whose task was rendered even more arduous by the incessant, if not very effectual, attacks of the captured maidens' small brother. The governess, fives-bat in hand, sat negligently on the stone balustrade, presiding over the scene with the cold impartiality of a Goddess of Battles. A furious and repeated chorus of "I'll tell muvver" rose from the lodge-children, but the lodge-mother, who was hard of hearing, was for the moment immersed in the preoccupation of her washtub. "Early Roman history; the Sabine Women, don't you know? It's the Schartz-Metterklume method to make children understand history by acting it themselves; fixes it in their memory, you know. Of course, if, thanks to your interference, your boys go through life thinking that the Sabine women ultimately escaped, I really cannot be held responsible." "I'm not certain exactly where I shall be for the next few days," said the dismissed instructress of youth; "you might keep my luggage till I wire my address. There are only a couple of trunks and some golf-clubs and a leopard cub." "Well, it's rather left off being a cub; it's more than half-grown, you know. A fowl every day and a rabbit on Sundays is what it usually gets. Raw beef makes it too excitable. Don't trouble about getting the car for me, I'm rather inclined for a walk." "Oh dear, no," said Lady Carlotta; "not at all tiresome - for me." Click on the picture above for some historical context. Add The Schartz-Metterklume Method to your own personal library.